With the operating period of the current solar policy of Uttar Pradesh already having expired on March 31, 2017, the Uttar Pradesh New and Renewable Energy Development Agency (UPNEDA) has issued a draft UP Solar power policy in draft for the state. The draft policy is open for comments till July 15, 2017. You can view the draft policy above. The draft policy, once approved, will be operative for 5 years or till a new policy is issued. According to the UP Solar power policy draft, the state of Uttar Pradesh has a solar potential of 23.8GW and is targeting 10.7GW of commissioned solar power by the year 2022, with 4.3GW of this capacity assigned to rooftops. It is also included in the draft that the state is targeting to provide 24 hours of electricity to both rural and urban households by the year 2018-19. Under the draft solar policy of 2017, solar parks with a minimum 100MW capacity will be set up and the Government will provide incentives to purchase land on lease or usage. It is also mandatory that at least 50% of the power produced from the solar parks will have to be sold to Uttar Pradesh Power Corporation Limited (UPPCL) or a distribution licensee. 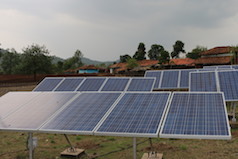 To encourage rooftop solar installations, the policy mentions that the Government shall promote and deploy rooftop plants for self-consumption on all State Government and Central Government-owned buildings. As for the incentives, the State Government will provide a subsidy between Rs 10,000/kW and Rs 20,000/kW on the first-come-first-served basis for the first 100MW applications submitted to UPNEDA in the private residential sector. In case the installation is delayed by more than six months, the subsidy will be withdrawn. The subsidy will be disbursed to the customer only after the commissioning of the project and submission of all the documents to UPNEDA. Just like the Solar Policy of Delhi, the height of the module structure will not be counted towards the height of the building and therefore no further permission of construction is needed. The nodal agency, that is UPNEDA will also ensure a single window clearance for all power producers, allowing to expedite the process. With the policy still under review, we expect further modifications in the content of the UP Solar power policy draft. We are excited to see that the state nodal agency has identified simplification of the process involved in getting permits and approvals as a major thrust area. To provide further support to rooftop solar in the state, the state nodal agency along with the Discoms should work towards better implementation of the Net Metering policy. However, even in the current state, the policy is a much-needed thrust to the solar segment in what is one of the largest states in the country but with a meager 269.26MW of solar power commissioned till the year 2017. It is a nice project but for UP, we have to be more cautious about implementation and monitoring of the project because UP has mastery in draining the subsidy funds by forged implementation by unfair means through Dalal’s as it has happened with Pradhan Mantri Kaushal Vikash Yojna. All other States have utilized this project but UP has only gone in fraud. Dear sir, we are in process of setting up a food processing unit at Saharanpur U.P. and need to connect to a solar energy distribution licensee for this area to set up solar energy system for this unit which require 80 kw solar energy. Thank you for your comment. Our customer delight team will be in touch with you very shortly. Alternatively, you can get in touch with us directly, using the Contact us page.